You're sure of a warm welcome to this early 20th century Le Crotoy house, a congenial meeting-place for sea-going fishermen. The 7 rooms and restaurant have all been fully renovated and decorated in the soft colours of the Baie. Book your family room and, above all, a table in the restaurant (very popular) for a gourmet weekend. 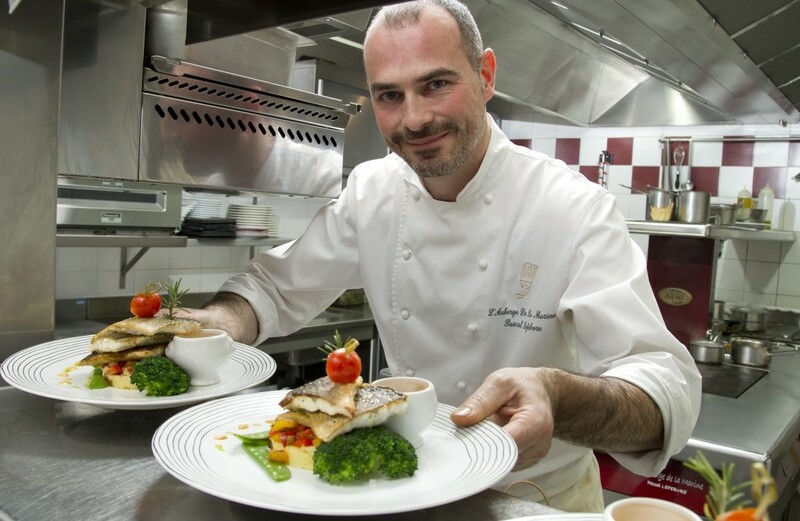 The chef, Pascal, prepares imaginative dishes based on produce from the Baie and local area. Welcome to our friendly restaurant close to the beach and harbour in Le Crotoy, at heart of the Baie de Somme. Seven rooms, fully renovated for your comfort, help create a harmonious interior. Imbued with the spirit of this place, closely linked to Le Crotoy's old fishing industry, we aim to maintain the traditionally hospitable atmosphere of this old inn which was a meeting place for the sea-going fishermen of the Baie de Somme. The Auberge de la Marine, in a typical early 20th century Le Crotoy house, serves culinary delights from the Baie de Somme and surrounding area in a truly outstanding setting.